The Rays Confidence Graph will appear every Wednesday and is a look at how much confidence Rays fans have in the Tampa Bay Rays. The graph is designed to give us a look at how our emotional bias as Rays fans fluctuates through time. The “confidence” in the team is an inexact measure of how fans feel about the team’s current strength as well as how much confidence fans have in the franchise for the next 3-4 years. Notes on this weeks agida-level can be found after the graph.. 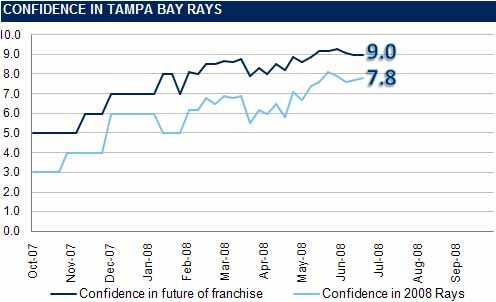 The most common response for “Confidence in 2008 Rays” was 8 (They will be in playoff contention all season) with 59.6%. The most common response for “Confidence in future of franchise” was 10 with 40.2%. 96.7% of respondents feel the Rays have a shot at the playoffs in 2008. That number is down from 97.8% a week ago. 97.8% of respondents feel the Rays should be at least a .500 team in 2008. Last week that number was 98.9%. I still love the optimism... it's refreshing!